Paying Ready Attention - Photo Gallery: Still Crazy! There’s is no question that unique Australian wildlife is one of the greatest of all reasons to visit Australia. I was stunned when someone told me that they visited friends stationed in Sydney for a couple of years and spent most of their time on the beach. What a waste! Life (the real one) comes first. I’ve never seen signs like those before! Hasn't that sign been doctored a bit? Do you really have kangaroos that look like dragons? And what is that winged critter? 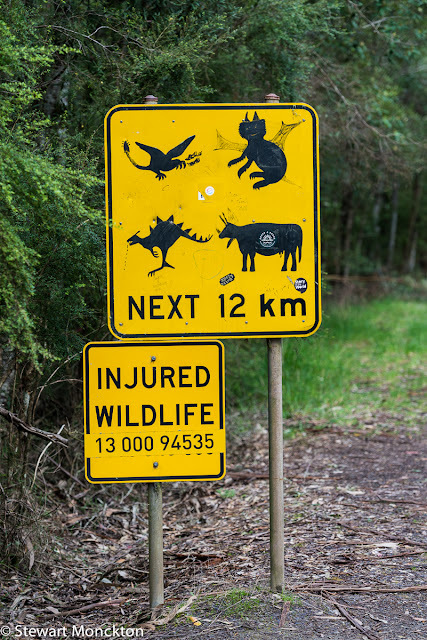 I would love to be in the alternative reality which offers an abundance of wild life and where you can see even kangaroos. The sing "Injured wildlife" scared me. Those are some mighty interesting wildlife! LOL! Had no idea you had so many dragons in Australia! A jumping dino. Its a first for me. Nice. Another visit to Aus is definitely needed as I didn't see any of those creatures! It's been 35 years since I visited Australia. I don't remember seeing the roadsides littered with dead wildlife in Queensland at that time, but I've no doubt that faster cars and less-caring drivers have resulted in these astonishing numbers.